The Griffin Construction department assists growers nationwide in all aspects of greenhouse planning, construction and maintenance. Whether it’s a new operation or expansion, upgrades or replacements, our team can help. 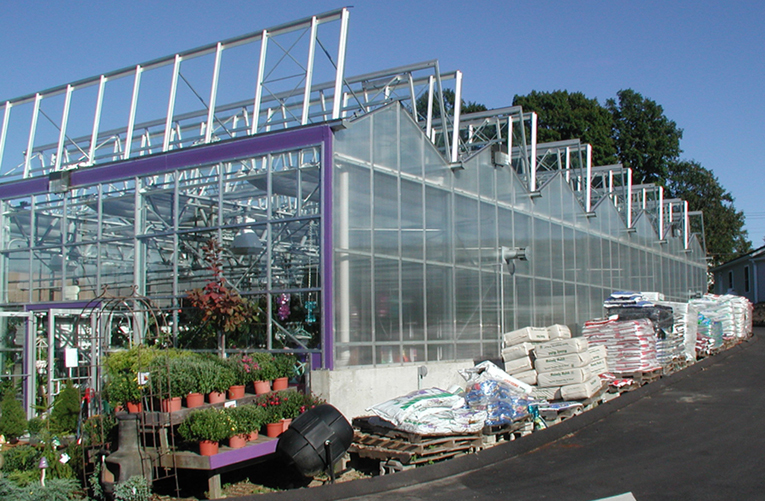 We offer a full portfolio of products including greenhouse frames, coverings, ventilation and heating equipment, shading systems, benching, environmental controls, soil handling and planting equipment. Browse our Project Showcase to see examples of finished structures we’ve constructed, or to refer to our products page for a more complete listing. Below is just a small sampling of the projects we have worked on. 1.1 What should a grower do first - before purchasing a greenhouse? 1.2 What does a greenhouse cost? 1.3 What authorities do I contact before purchasing a greenhouse? 1.4 What do they require for greenhouses? 1.5 What exactly is a non-code house? 1.6 How do non-code houses vary? 1.7 What is a basic greenhouse? 1.8 What are the high-end greenhouses? 1.9 Do most growers stick with one type of greenhouse? 1.11 What exactly is zoning? 1.12 Does it matter what materials I build a greenhouse with? 1.13 What should I look for with in a location? 1.14 Do I need a licensed engineer to stamp finished greenhouse drawings? 1.15 Should I be concerned about expansion? 1.16 Is there a difference between production and retail greenhouses? 1.17 Do setbacks affect greenhouses? 1.18 Are there any fire-code issues with greenhouses? 1.19 Does the crop determine the type of greenhouse needed? 1.20 Does the NGMA offer any publications regarding greenhouse structures? 1.21 How do I chose a greenhouse manufacturer? 2.1 Why is watering so important? 2.2 What are the effects of underwatering? 2.3 What are the effects of overwatering? 2.4 What are the general rules of watering? 2.5 When should water be tested? 2.6 How do I conduct a soluble-salt test? 2.8 What does hardness measure? 2.9 What types of watering systems are there? 2.10 What is a closed system? 2.11 What is an open system? 2.12 Why is hand watering uneconomical? 2.13 What are the different fresh-flower watering systems? 2.14 What types of containerized-plant watering systems can be used in a greenhouse? 2.15 How does tube watering work? 2.16 What does overhead sprinkling do? 2.17 Should I use boom watering? 2.18 What is mat watering? 2.19 How does a basic flood system operate? 2.20 How do I grow crops using a float system? 2.21 What are the benefits of pulse watering? 2.22 How do I maintain my irrigation system? 2.23 How can I find out more about irrigation systems? 3.1 How does heat loss occur? 3.2 What is the "U" factor? 3.3 What is a British Thermal Unit? 3.4 Are there any special considerations for calculating heat loss? 3.5 What is zone heating? 3.6 How important is good ventilation? 3.7 How is air circulation effected by cold weather? 3.8 When do I need perimeter insulation? 3.9 Does a thermal blanket save on heating bills? 3.10 What is combustion efficiency? 3.11 What is thermal efficiency? 3.12 What is distribution efficiency? 3.13 What are the different heating types? 3.14 What is convection heat? 3.15 What is conduction heat? 3.16 What is radiation heat? 3.17 What are the main functions to heating a greenhouse? 3.18 What is a unit heater? 3.19 Are there any cost considerations? 3.20 Should I consider a steam system? 3.21 What are the benefits of a hot water system? 3.22 How many ways can hot water be used to heat? 3.23 How important is insulation? 3.24 What is floor heating without a slab? 3.25 How does bench top heating work? 3.26 What is a hot water (hydronic) unit heater? 3.27 What type of boiler should I purchase? 3.28 What are the most common boiler designs available for greenhouse heating? 3.29 How does infrared radiant heating work? 3.30 When should I use a small electrical resistance system? 3.31 Should I install more than one heating system? 3.32 So, which heating type is best for me? 3.33 How do I find out more about heating? 4.2 What is a ventilation rate? 4.3 What is the difference between natural and mechanical ventilation? 4.4 What does cooling refer to? 4.6 Why is circulation important to my plants? 4.7 Why is ventilation important? 4.8 Why should I use exhaust fans? 4.9 How do I choose a system? 4.10 How do I get the best results from my system? 4.11 I have a hobby house greenhouse do I need ventilation and cooling system? 4.12 Do I need to change my system in the summer? 4.13 What happens to the cooled air as it moves through the house? 4.14 Is elevation a factor in creating ventilation and cooling systems? 4.15 How many fans are needed and what do I need to know before having them installed? 4.16 Where should the cooling pad be placed? 4.17 What if the pad is located outside the air inlet opening? 4.18 How and why should I use Baffles? 4.19 How do I maintain my water system? 4.20 Are winter and summer ventilation systems the same? 4.21 Do I need to ventilate differently in the winter? 4.22 Can I use gravity to circulate the air in my greenhouse? 4.23 What do I use thermostats for in my greenhouse? 4.24 What do I use a Humidistat for? 4.25 How can I find out more about ventilation? 5.1 How does electricity work? 5.2 What is voltage drop? 5.3 How do I eliminate voltage drop? 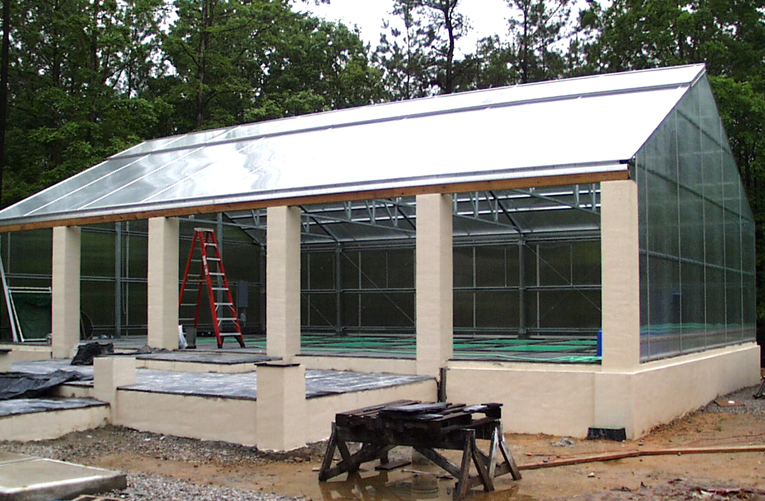 5.4 What are the most important things to consider when creating an electrical greenhouse system? 5.5 What is a load schedule? 5.6 What is the main service and branch panel board layout? 5.7 What are one-line power diagrams? 5.8 What is a conduit and wiring layout? 5.9 What are control diagrams and schematics? 5.10 Where should I locate my main service? 5.11 What type of power system should I get? 5.12 What are the advantages to three-phase power? 5.13 Do I need a standby generator? 5.14 Is elevation a factor in creating ventilation and cooling systems? 5.15 How do voltage drops effect crop lighting? 5.16 What are the benefits of high-efficiency motors? 5.17 What is a ground-fault circuit interrupter? 5.18 Where can I attain more information regarding electrical standards? 6.1 How are environmental control computers important in raising a crop? 6.2 Do they respond to both the greenhouse and outdoor environments? 6.3 How can they minimize energy costs? 6.4 Is there a way to reduce the amount of chemicals used on crops? 6.5 Can labor be reduced through an environmental control system? 6.6 Can an environmental control computer change crop quality? 6.7 Does the computer keep records and how can they be used? 6.8 Can the computer help in plant modeling? 6.9 How does the computer acquire data from the greenhouse? 6.10 How does the computer control the equipment? 6.11 Does the computer generate alarms? 6.12 How will the computer respond during a power failure? 6.13 What are the advantages of a centralized single system? 6.14 What are the disadvantages of a centralized single system? 6.15 What are the advantages of a multiple computer system? 6.16 What are the disadvantages of a multiple computer system? 6.17 What types of temperature sensors are there? 6.18 What kinds of humidity sensors are available? 6.19 What are the common types of light sensors used with the computers? 6.20 How can I measure wind speed? 6.21 Are there different wind direction sensors? 6.22 Are there different types of precipitation sensors? 6.23 Are there sensors that test pH? 6.24 Can the sensors test the EC? 6.25 How can I learn to use my environmental control computer? 6.26 Where can I get more information about environmental controls? 7.1 What are greenhouse curtains? 7.2 How do the curtains provide heat retention? 7.3 How do the curtains provide shade and cooling? 7.4 How can I attach the curtains to my greenhouse? 7.5 How does the gutter-to-gutter system work? 7.6 How does the truss-to-truss system work? 7.7 How does the drive mechanism work and are there different methods? 7.8 What is a support system? 7.9 What type of material are the shade and retention curtains made of? 7.10 What type of material are blackout curtains made of? 7.11 What are sidewall curtain systems? 7.12 What types of exterior curtain systems are available? 7.13 How can I find out more about curtain systems? Back to Top What should a grower do first - before purchasing a greenhouse? The first thing, before purchasing a manufacturer, is to contact the local authorities. Because zoning varies from one county to the next, one greenhouse may have a totally different situation then a greenhouse just across the street. Simply put, each location is different and there is no one answer. While the United States recognizes 50 state governments, there are over 87,000 local governments. The possibilities of code and zoning combinations are endless. Zoning codes and building requirements can be any mix. The laws are becoming stricter and the negative consequences of noncompliance worse. We cannot stress enough the importance of checking with your local authorities before doing anything. Back to Top What does a greenhouse cost? Probably one of the most common questions the association receives is regarding costs. Unfortunately, there is no quick answer to the question. 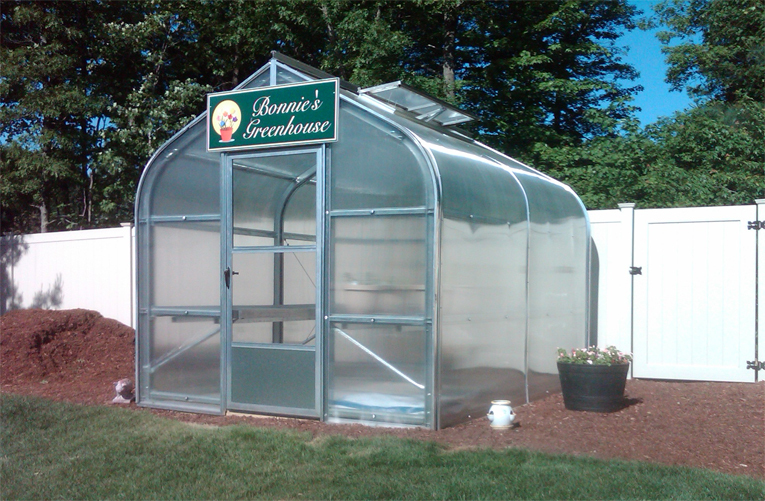 A better question is what would a greenhouse cost that fits your specific needs? Cost is not easily determined because greenhouses vary due to local codes and zoning, the purpose for the greenhouse, its geographical location and future expansion goals. Back to Top What authorities do I contact before purchasing a greenhouse? First check with your zoning authorities for your specific location's setbacks, building material requirements, and allowed businesses. Secondly, talk with the planning commission regarding building codes. Ask them what code body that they recognize and for which year. Also determine if stamped and licensed drawings, by an engineer, are required. 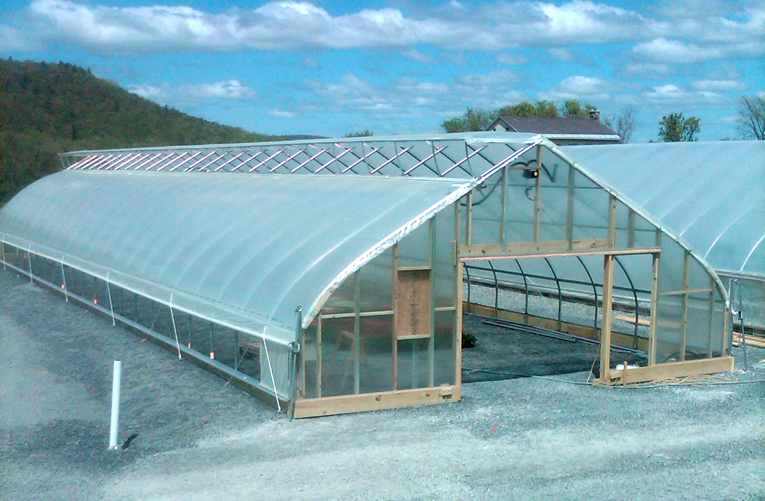 If applicable, also ask what the wind and snow loads requirements are for a greenhouse. Then check with the fire authorities. Back to Top What do they require for greenhouses? 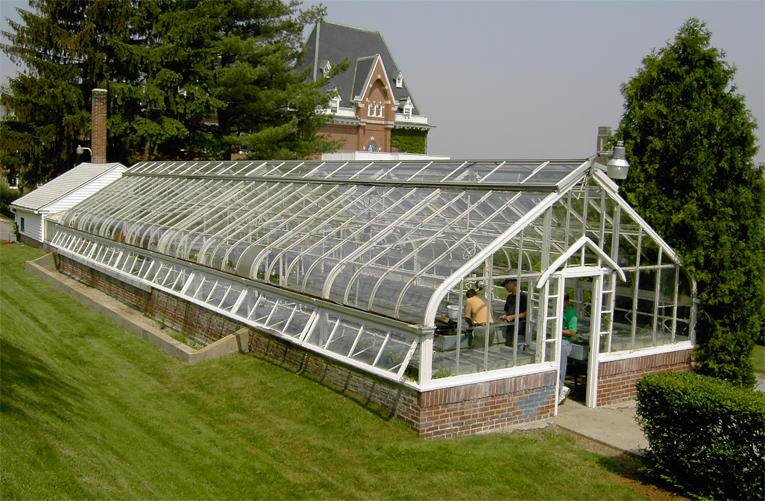 While greenhouses are unique, they often are not treated as such. Find out all their fire codes, specifically sprinkler system and covering requirements. The tough questions should be answered before designing a greenhouse, not after. While these questions may seem overwhelming to the new grower, there is help available through any of the National Greenhouse Manufacturers Association's structural members. Back to Top What exactly is a non-code house? 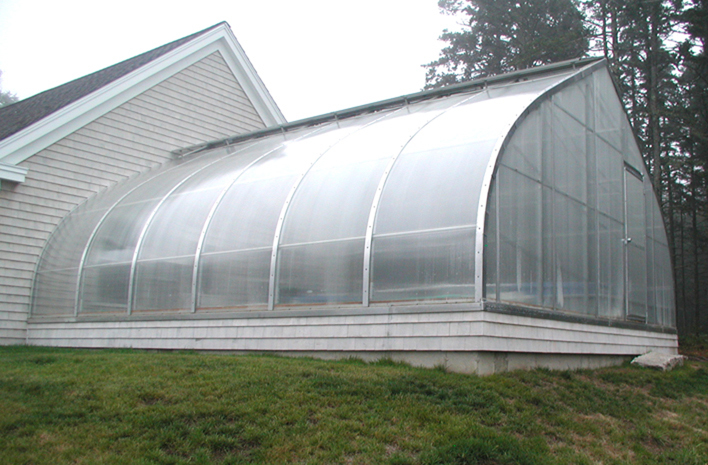 The simplest commercial greenhouse is referred to as a cold frame. Cold frames are designed for wintering-over crops and for shade. They are considered temporary and do not meet codes. Cold frames are very basic, but can have some significant variables. While being non-code houses, cold frames can still have structural strength by being built with steel tubing. Back to Top How do non-code houses vary? When growing crop on the floor, sidewall height is not necessary. However, if you're growing crop on benches, sidewall height is very important. Height is also and issue if any overhead equipment is to be hung from the structure. Back to Top What is a basic greenhouse? While there is no such thing as a 'basic' greenhouse, a standard greenhouse requires permits and must be built to local building codes. 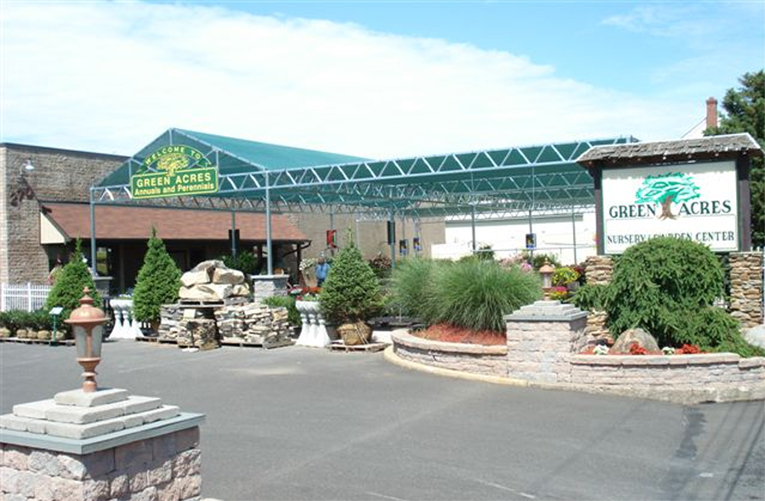 These greenhouses are the heart of the industry and come in all sizes and shapes. They are not necessarily flashy, but are designed to provide years of efficient, dependable crop protection. These code greenhouses have the added benefit of working well with environmental controls and can stand alone or be gutter-connected. Back to Top What are the high-end greenhouses? The top of the line greenhouses can be just the answer for certain growers. These greenhouses are fully automated using sophisticated controls that open roofs, close vents, survey outside weather, etc. 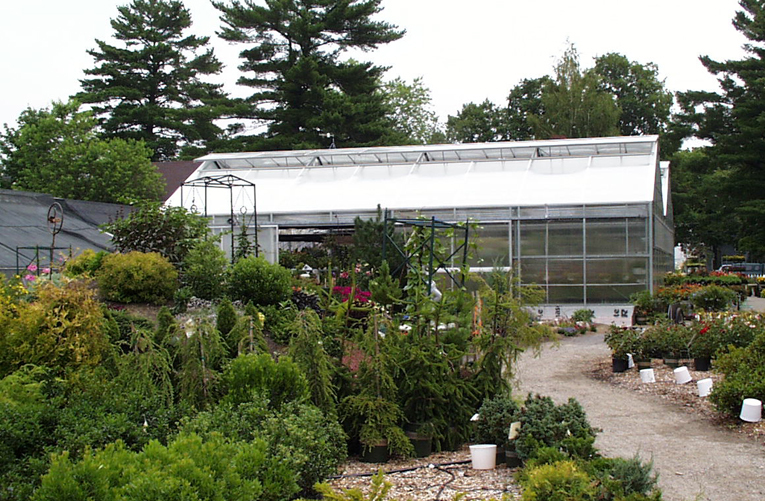 These high-end greenhouses can control any environment to the strictest of margins. Controls have become so finite that a good grower can program and monitor activity and results in any given zone, at any given time. The NGMA's structural members strive to keep up with these technological advances and make them readily available to growers. Back to Top Do most growers stick with one type of greenhouse? No, many growers will have a mix of all levels of greenhouses. They will often integrate different types and styles of greenhouses to optimize crop quality without compromising economics. Thus a grower must know where the greenhouse will be built, local zoning and codes, weather patterns, and what time of year the crop will be grown. Back to Top Are greenhouses insurable? Yes, look into the insurability of a greenhouse before purchasing. Ask whether your insurance company will provide Replacement Cost coverage for the structure. What perils do they insure? Some companies will only provide a very limited number of insured perils and may exclude those of most concern. Do they offer coverage for plant material and how will they value the crop should there be a loss? Like with purchasing an automobile, insurance information allows you to make an educated decision. Back to Top What exactly is zoning? Zoning is defined as any section or district in a city restricted by law for a particular use, as for homes, parks, and businesses. Zoning is thus very location oriented. In Santa Fe, New Mexico, a building can be no higher than the Cathedral Tower. In Washington D.C. nothing can be higher than the Capitol Dome. In small towns and counties, where there is limited manpower, zoning is often outdated or non-existing. A grower that ignores local zoning laws can literally be shut down. Back to Top Does it matter what materials I build a greenhouse with? Yes, zoning also includes building materials. Government regulators can dictate exact specifications for such items as brick, coverings, glass, and what the overall building must look like when erected. Back to Top What should I look for with in a location? As with any real estate decision, location is everything. There are actually cases where the location can mean a reduction in code regulations which is referred to as an agricultural reduction. For example a 25% agricultural reduction on a 20# wind load code would mean the greenhouse need only be #16. This means less expense for the grower and would effect how a manufacturer would design a greenhouse. Be sure to check with local planning and zoning authorities. Back to Top Do I need a licensed engineer to stamp finished greenhouse drawings? Yes, some states require that a licensed engineer stamp your drawings. If this is a requirement of your state, the engineer must be licensed in that state in order to stamp your calculations and drawings. An engineer can be licensed in numerous states, not just where they are located. To be licensed they must be tested and or pay a fee. Back to Top Should I be concerned about expansion? Planning ahead is always beneficial. 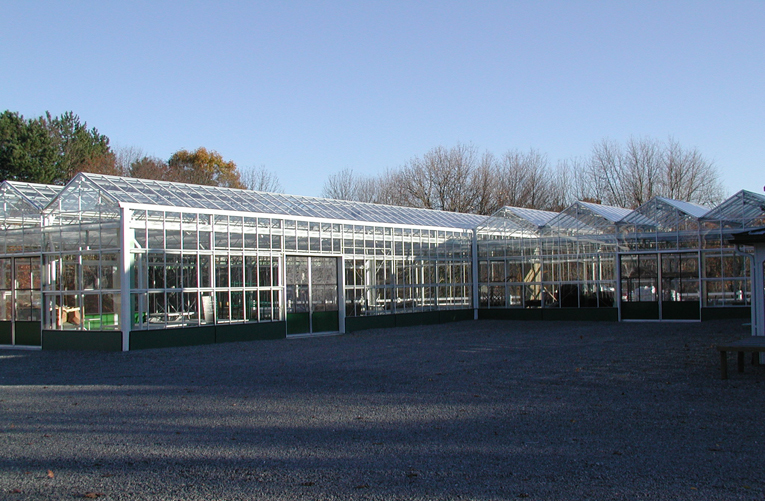 Be sure to convey to your NGMA greenhouse manufacturer what your future plans for expansion will entail. Placement and types of equipment depend greatly on whether a grower plans on expanding. Most houses can be lengthened or added onto the side with advance planning. Back to Top Is there a difference between production and retail greenhouses? Yes, the codes are very specific as to the usage of a greenhouse with respect to the general public. Fire code issues are an example of one of the major differences. A production house is defined as a greenhouse that is occupied for growing a large number of flowers and plants on a production basis or for research, without public access. 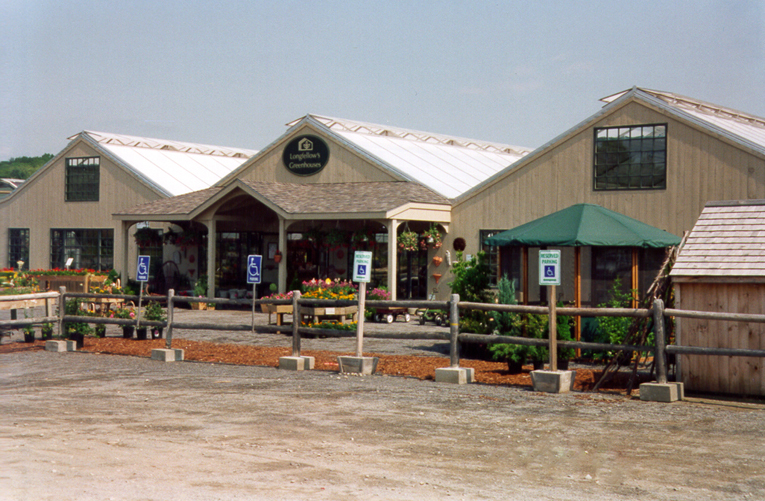 A retail greenhouse is occupied for growing large numbers of flowers and plants while having general public access for the purposes of viewing and purchasing various products. 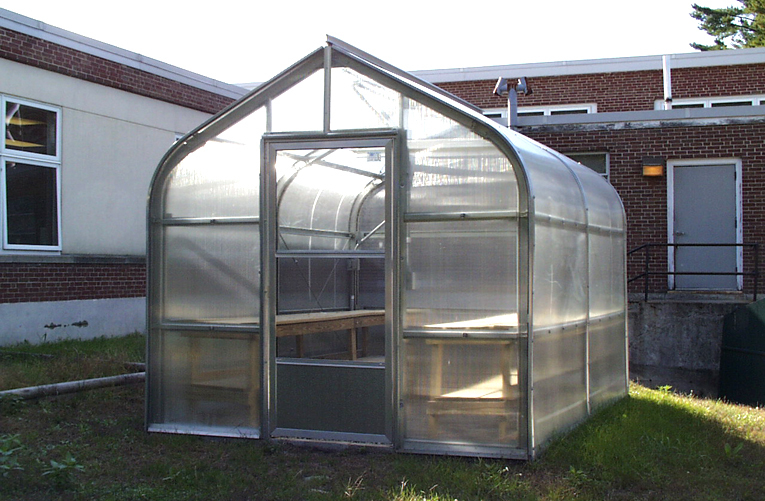 Included in this category are greenhouses occupied for educational purposes. Back to Top Do setbacks affect greenhouses? Yes, they can, depending on your location. A setback which is more common in larger cities, is the amount of feet from the street a greenhouse must sit to be built. For example, a building may be required to set back 50' from the curb for what they call 'street appeal'. Zoning setbacks are also lot specific and can vary from one lot to another. Back to Top Are there any fire-code issues with greenhouses? Yes, there are fire codes specific to greenhouses and they vary depending on the area. Many growers have elaborate drawings made up only to find out that none of the fire codes have been addressed. 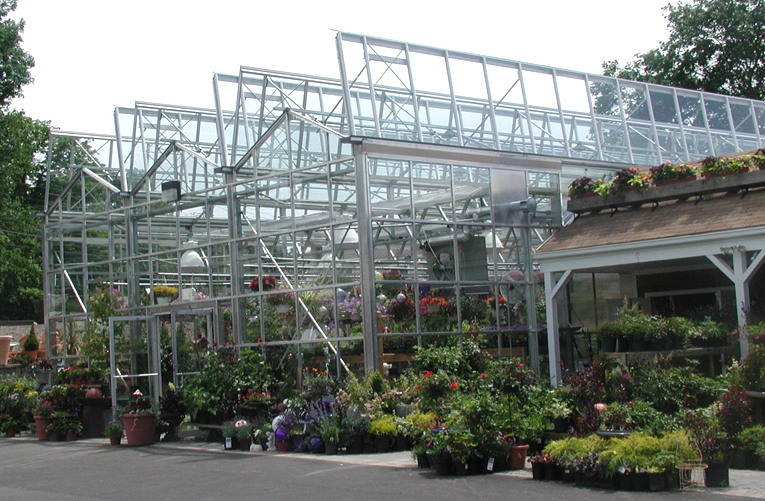 It is not uncommon for a retail greenhouse to be required to have a sprinkler system, even though most greenhouse insurance companies do not offer a premium reduction for their installation. 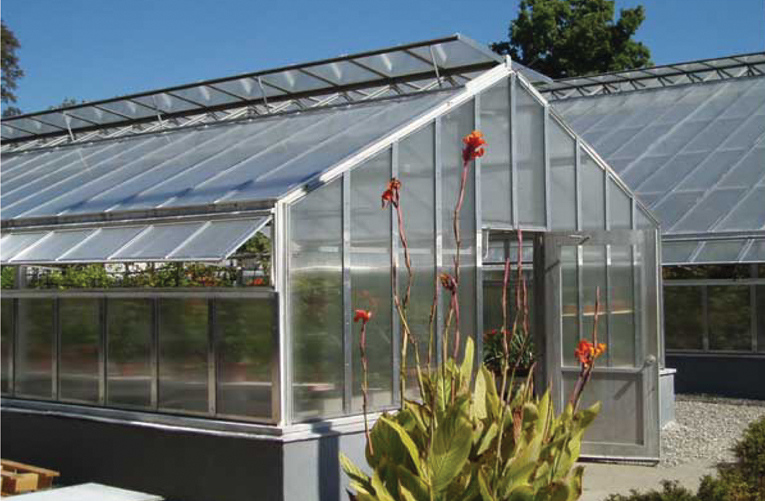 Before you invest in drawings, find out what fire codes affect a greenhouse at your location. Fire codes are becoming stricter, particularly for greenhouses that welcome the public. Nothing will bring your building to a halt faster than not meeting a fire code. Back to Top Does the crop determine the type of greenhouse needed? Crop is important when choosing a greenhouse, but seldom does a grower start and stay with the same crop. We often see growers completely change or add to their existing crop line. When it comes to type of crop, make sure your greenhouse is designed to be flexible. Back to Top Does the NGMA offer any publications regarding greenhouse structures? Yes, the NGMA has published a notebook of standards that includes curtain systems, design loads, electrical design, environmental control, glazing, heat loss, heating systems, insect screening, ventilation and cooling. The documents can be downloaded off the NGMA website or purchased from the NGMA for $25 US (includes shipping within the United States). Back to Top How do I chose a greenhouse manufacturer? 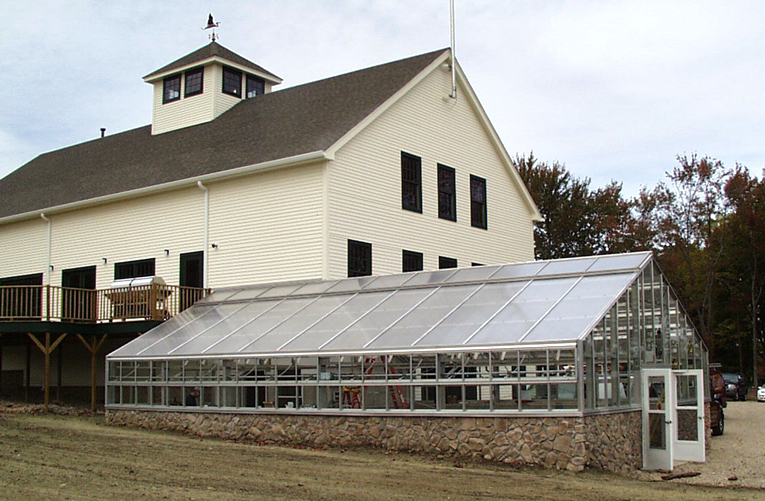 When choosing a greenhouse manufacturer look to any of our NGMA structural manufacturer members. 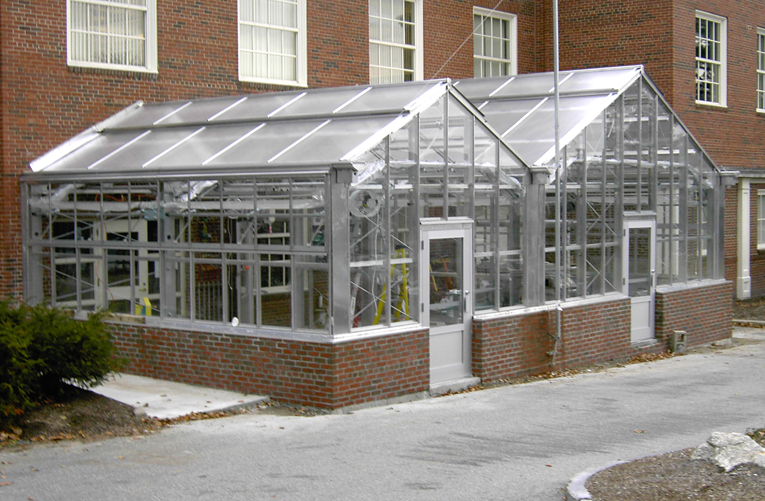 All of our structural greenhouse manufacturers promote code compliance and promulgate industry standards that insure code compliance. Back to Top Why is watering so important? Crop quality often depends on plant irrigation. When and the amount of water are important crop quality. We all know the importance of irrigation - it is essential to crop production. Next to light, there is nothing that will destroy your crop faster than over/under watering. Back to Top What are the effects of underwatering? When plants are not watered enough, plants wilt, resulting in smaller leaves, shorter stem internodes (the length of the stem between leaves), and a hardened appearance of the plants. In some cases, leaves may begin to burn and spread inward, affecting whole leaves. Back to Top What are the effects of overwatering? When water is applied too frequently plants become larger, taller and softer. This is undesirable because plants wilt easily and often do not survive shipping. If the oxygen is cut off the results is damaged root systems. Back to Top What are the general rules of watering? Use a well-drained substrate. When the root substrate is drained and aerated, proper watering can be achieved, giving the plant desirable texture and structure. Water thoroughly each time. It is important to water all of the substrate each time the water is applied so that the water reaches the roots and produces a healthy plant. Water before moisture stress occurs. You should water just before moisture stress occurs. The result is a properly aerated system as well as healthy root development. Back to Top When should water be tested? The chemical quantity in the water is crucial to the survival of the plant in the greenhouse. Anytime a new water source is established, it should be tested. During the first two years, you should test the water at least twice a year. It is best to test during a dry period and a wet period. After you have established a water quality pattern, water needs to be tested every couple years. Back to Top How do I conduct a soluble-salt test? The soluble-salt test measures all electrically charged ions dissolved in water. The higher the salt content, the more electrical currents are flowing through the sample. High salt levels may be detected by observing wilting of plants during the bright times of the day even when the roots are moist. The overall growth slows and some leaves may show circular spots across the leaf blade. Back to Top What is alkalinity? Alkalinity is a measure of carbonate amounts plus bicarbonate in water. Applying alkaline water is similar to applying limestone. An excessive alkalinity level is when the pH of the substrate rises to an unacceptable level at the end of a crop. The three crop situations that have a critical alkalinity level are the length of the crop period, the plant-to-substrate ratio, and the upper substrate pH level. Back to Top What does hardness measure? Hardness is a measure of the calcium and magnesium content in water. These two elements should be balanced to prevent calcium or magnesium deficiencies. When there is high alkalinity in water, a hardness test should be done. Back to Top What types of watering systems are there? There are several methods and ways to water plants. Generally they fall into three categories: hand watering, fresh-flower watering systems, and containerized-plant watering systems. There are both closed and open systems. Back to Top What is a closed system? A closed irrigation system is any method for growing plants in which the nutrient solution is recirculated. Nutrients are not allowed to leach from the pot or bench to the ground. Back to Top What is an open system? An open irrigation system is any system for growing plants in which nutrient solution is allowed to pass through the root zone and out into the environment. Back to Top Why is hand watering uneconomical? Hand watering is considered uneconomical because it is only used when watering flats or in "spot watering", where some areas of the crop are drier than others. Hand watering is labor inefficient. It becomes expensive when labor wages are paid at an hourly rate and is often left to inexperienced workers who like to speed up the process, leaving the crop under- watered. Back to Top What are the different fresh-flower watering systems? The different types of fresh-flower watering systems are perimeter watering and turbulent twin-wall watering. Perimeter watering is a plastic pipe around a perimeter of a bench with nozzles that spray water over the substrate surface below the foliage. The turbulent twin-wall hose system is popular because long lengths of bench can be handled from a single header. They are both open systems. Back to Top What types of containerized-plant watering systems can be used in a greenhouse? Containerized-plant watering systems include tube watering, overhead sprinklers, boom watering, flood and float systems, and pulse watering. Back to Top How does tube watering work? Tube watering is a standard open system used when automatically watering potted plants. The water is carried to each pot by a thin tube available in various sizes. Each tube must be the same length so that the water flows evenly to all pots. Back to Top What does overhead sprinkling do? Overhead sprinklers are used mainly for crops that tolerate wet foliage. Pipes are installed above the plants and nozzles with varying spray ranges are installed to cover all plants. Back to Top Should I use boom watering? Boom watering can function as either a closed or an open system used for producing seedlings grown in plug trays. This enables each seedling to grow in an individual cell when watering precision is extremely important. The boom extends from one side of the greenhouse bay to the other, propelled by an electric motor. Back to Top What is mat watering? The mat watering system is a closed system. Potted plants are planed on a constantly moist mat that soaks up the nutrients through capillaries. All pots may be placed on a mat and no adjustment is needed when changing pot size. Back to Top How does a basic flood system operate? A flood system pumps water or fertilizer into a bench, trough or floor long enough to reach the plant capillaries. The water/fertilizer is then drained and the whole process is repeated after a given amount of time. Back to Top How do I grow crops using a float system? 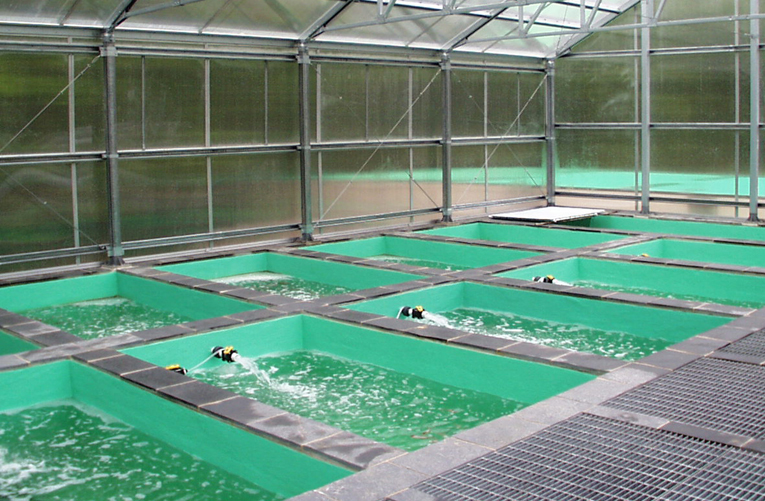 In a float system, seedlings are grown on trays that float on a nutrient solution. After a determined amount of time, fertilizer is added until seeds form. The seeds then float on the solution in the trays and water is added when needed allowing the crops to grow. Back to Top What are the benefits of pulse watering? Pulse watering is an open system that is used in order to save water from being over-consumed. Water or fertilizer is applied several times during a drying cycle instead of just once at the end of the cycle. However, less fertilizer is applied each time so the concentration is lower. Back to Top How do I maintain my irrigation system? A watering system should be cleaned and sterilized; otherwise crops can become contaminated. Depending the types of pipes used in the greenhouse you may be able to take them off and soak them in disinfectant or simple take a sponge soaked in disinfectant and apply it to the pipe and/or nozzles. Back to Top How can I find out more about irrigation systems? You can find out more about irrigation systems by contacting the NGMA or visiting the NGMA website. Back to Top How does heat loss occur? Heat loss occurs from a greenhouse structure whenever the interior temperature exceeds the exterior temperature. The rate at which it occurs is affected primarily by the efficiency of the covering materials (glazings) installed on each surface (roof, side walls, and end walls). The most commonly used covering materials all have published heat transfer factors called "U" factors that provide a means of calculating their impact on heat loss in different scenarios. Back to Top What is the "U" factor? "U" factors are the inverse of the commonly used "R" factors, where "U" = 1 / "R". The lower the "U" factor, the less ability your glazing material has to transfer heat, therefore, the lower the heat loss. Back to Top What is a British Thermal Unit? In North America, heat loss is typically expressed in terms of total British Thermal Units per Hour (BTUH) loss. British Thermal Unit (BTU) = The amount of energy it takes to warm one pound of water 1� (degree) Fahrenheit (F). Back to Top Are there any special considerations for calculating heat loss? Yes, there are unique crop considerations. 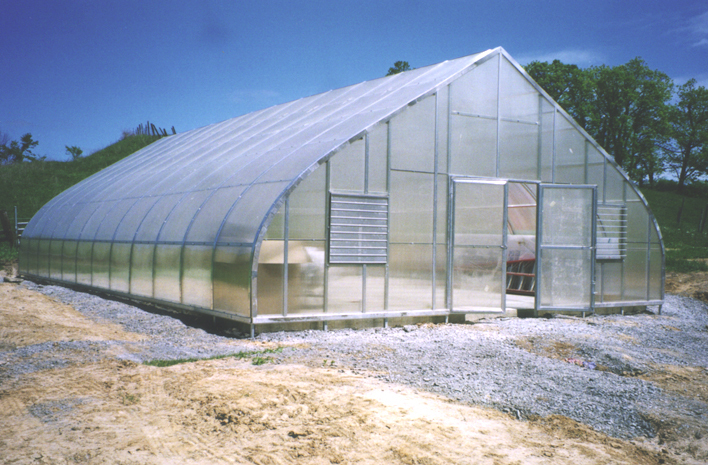 Many growers do not use the total volume of their structures to grow crops. Consequently, they may not need to have the total conductive heat load available in their heating system. While the standard means of calculating heat loss are well accepted and documented, considerations should be made as to whether your crop requirements justify installing the total number of BTUH indicated by this calculation. Back to Top What is zone heating? A zone heating system is one that places the BTUs in a specific portion of the structure. Back to Top How important is good ventilation? Ventilation essentially provides the same benefit regardless of the season. Ventilation, in addition to removing excess heat in the summer, replenishes carbon dioxide and assists in the control of humidity levels. Recommended summer ventilation rates vary but a common accepted rate is 8 cubic feet per minute (CFM) per square footage of floor space. Winter recommended ventilation rates are 1.5 CFM. Winter ventilation needs to be introduced without producing cold drafts on the plants. Winter ventilation requires a thorough mixing of the ventilation air and the warm inside air. Mixing is readily achieved by admitting the air in small high velocity openings. Back to Top How is air circulation effected by cold weather? During cold weather, when greenhouses are virtually closed in, there is often insufficient air circulation to maintain desired conditions. The appropriate type of air circulation equipment will help obtain a more uniform relative humidity and provide the proper air movement. Continuous circulation produces gentle air movement and has been reported to maintain better leaf surface microclimates and prevent pockets of disease-producing high humidity. This gentle air circulation may result in slightly higher heating demand, yet many regard it as advantageous from a plant production and quality standpoint. Back to Top When do I need perimeter insulation? A substantial amount of heat energy can be lost out of the perimeter of a greenhouse through the ground below the perimeter walls and ends. This is conductive heat loss that can be minimized by installation of perimeter installation of insulating boards below the frost line. Back to Top Does a thermal blanket save on heating bills? Installation of a thermal blanket system can impact the total heating requirement of your greenhouse by reducing the heat loss. These systems are typically designed to automatically retract in the daytime and close in the nighttime to trap energy. Back to Top What is combustion efficiency? This term is the most basic description of efficiency. It denotes the percentage of fuel burned and turned into heating energy. Back to Top What is thermal efficiency? This term is a measurement of the actual amount of available energy that transfers into the heating medium. It is derived by operating a piece of equipment at a steady state and measuring how much fuel is used vs. how much useable heat comes out. It is most typically used in reference to boilers. Back to Top What is distribution efficiency? This is the measure of efficiency of how well the heating equipment actually delivers the BTUs to your plants and structure. This expression addresses how energy is distributed and transferred to the objects requiring heat. Back to Top What are the different heating types? All forms of heating fall into one or more of three basic principles: convection, conduction, or radiation. Since all three methods of heat transfer are common and effective in greenhouse heating, it is important to understand the fundamentals of each. Back to Top What is convection heat? Convection heat utilizes the forces of natural air circulation currents to transfer heat. Convection involves two basic principles: First cold air displaces warm air and second warm air rises in the presence of cold air. With convection, heat is transferred by air currents, which transport energy throughout the structure. When these air currents pass by plant material, energy is transferred to the plant. Because of this, it is very important that some means of air circulation is used (HAF fans, perforated polyethylene duct tubes, or ceiling fans) to assure the maximum amount of warm air is transferred to the plant environment to evenly distribute heat throughout the structure. Back to Top What is conduction heat? Conduction heat utilizes direct application to transfer heat energy to the plant. Physically touching any warm object demonstrates the principle of conductive heating. In greenhouses, this type of heating is most commonly distributed with hot water tubes, and occasionally electric resistance strips, which are placed directly on the growing surface or in the growing media. The soil, containers, and growing surface in direct contact with the warm tubes or strips are heated and subsequently transfer that heat energy to adjacent material. Back to Top What is radiation heat? Radiation heat utilizes electro-magnetic infra-red waves to transfer heat energy. Since this is a little understood form of heating, it bears detailed explanation. Anyone who has warmed themselves by a hot wood stove or warmed their hands at a camp fire has experienced radiant heat. It is also demonstrated by standing in the sun on a winter's day; or walking near a brick wall that has been exposed to the sun during the day. In both examples, although the air may not be warm, you are able to feel the heat energy radiating from these surfaces. Back to Top What are the main functions to heating a greenhouse? The conversion of fuel to heat energy is typically accomplished through combustion with a burner installed in a boiler or heater combustion chamber. That heat energy is then distributed through the greenhouse through pipes, ducts, tubes, or air. Once the energy is distributed through the house, it must then be transferred to the plants and soil by convection, conduction, or radiation. Finally, once transferred to the plants and soil, they must in turn absorb its energy and convert it to usable heat. How each of these functions is accomplished has a significant effect on both the efficiency and effectiveness of the heating system. Back to Top What is a unit heater? The definition of a unit heater is a fan equipped device with a means to heat the air being provided by the fan. 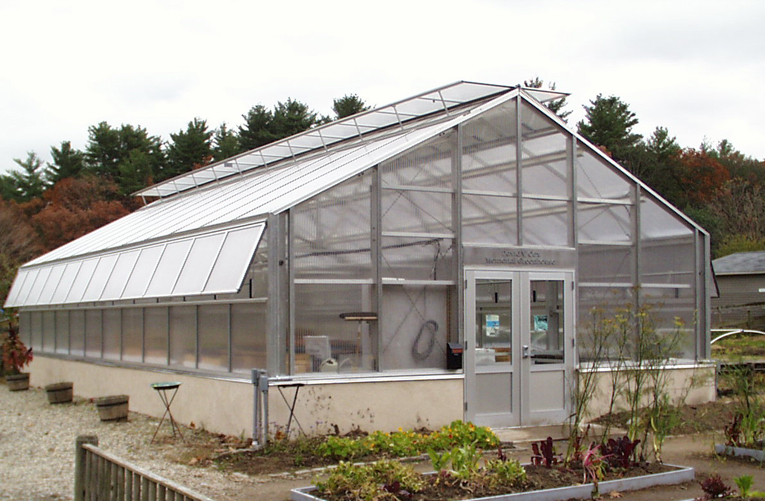 They are the most commonly used greenhouse heating equipment. Unit heaters are valuable in that they provide warm air temperatures which are imperative for leaf transpiration and snow load concerns. Unit heaters gently circulate warm air to prevent temperature stratification, reduce mold and fungal disease. Unit heaters are available in oil fired, electric, hot water or steam, and gas fired. The most popular being the gas fired unit. Unit heaters are typically suspended from the greenhouse framing. Floor mounted units are also available. Back to Top Are there any cost considerations? Comparing initial unit costs using comparable BTU capacities, oil fired units are the most expensive followed by gas, then electric, then hot water unit heaters. When installation expenses are considered, oil fired again are the most expensive followed by hot water units. Gas fired unit heaters with one way gas piping and venting can be installed for one-half the cost of hydronic units. Back to Top Should I consider a steam system? In the past century, there was a time when steam was very common as a means of heating greenhouses. It is a manageable, transportable method of heating that is easy to provide bottom, top, and perimeter heating with. Steam can be plumbed through pipe coils in the greenhouse with either bare or finned pipes, or using hydronic forced air unit heaters. The initial cost of equipment, excessive maintenance, the lack of qualified technicians and installers, and the many advances in other systems have all conspired to make steam systems most probably a heating method of the past. There is however, renewed interest in the ability to generate steam as a means of sterilizing soil media as chemicals such as methyl bromide are pulled from the market over environmental concerns. Back to Top What are the benefits of a hot water system? 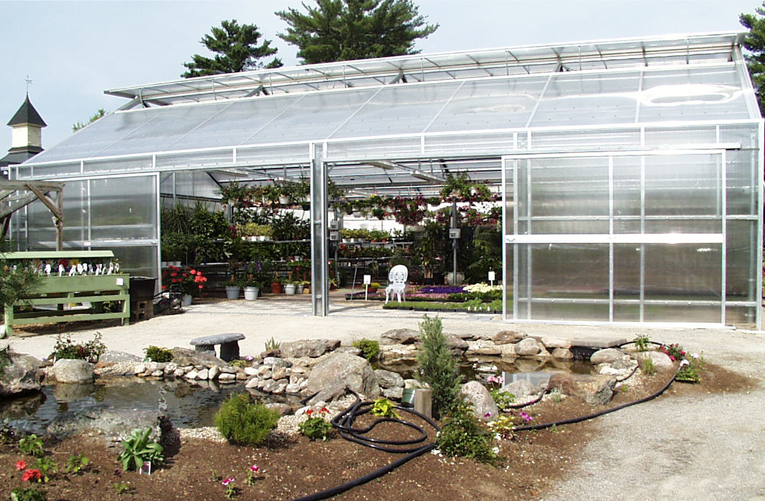 Hot water or "hydronics" systems are available for providing heating to a greenhouse space. Because of their initial cost, many growers have felt that they cannot justify the investment required to install hot water. However, many advancements in technology over the past decades have made these systems more affordable. Hot water systems do require specific engineering for each and every application, and installation is complex. However, the energy efficiency advantages they offer and the potential to enhance evenness and growth in a greenhouse facility make them attractive enough to warrant researching if hot water is a logical alternative for you. Back to Top How many ways can hot water be used to heat? Perhaps the simplest of means of transferring heat from hot water is through bare pipes of steel, black iron, copper, or aluminum. Pipes can be located around the perimeter of a structure and installed under benches, in the rows of cut flowers or vegetable crops, and at gutter height as well. The addition of finned elements to the surface of a pipe enhances it's ability to transfer heat by expanding the pipe's surface area. This reduces water volume to heat and less actual footage of piping is required to do the same work. Concrete floors are becoming quite common in greenhouses. In part because of environmental legislation that requires growers to capture drainage and run-off, and also to accommodate mechanization equipment and general cleanliness. Back to Top How important is insulation? Insulate! It cannot be stressed enough that a heated concrete slab floor should be insulated around the perimeter and as deep as the frost line in your area. Some reports indicate that up to 50% of your heat can be lost out the perimeter of a heated slab if no below grade insulation is installed. Some growers have even installed insulation below the slab. The best type of insulation to use is one of the extruded styrene boards, usually 1.5" - 2" inches thick. Back to Top What is floor heating without a slab? Some systems can be installed on top of weed barrier or down in the sand or gravel of the floor of your greenhouse. These systems are quick and simple to install, but they do not provide the run-off protection of a slab. Back to Top How does bench top heating work? Bench top heating systems use conductive heat transfer to deliver heat to plants placed directly on top of a multiplicity of parallel tubes. Small synthetic rubber tubes with high UV, heat, and chemical resistance are placed on the growing surface of benches and contain warm water which is circulated to and from a hot water supply, typically a boiler. These systems offer growers the ability to control the soil temperature of their plants and they also contribute a portion of the heating energy required to meet the total conduction heat loss of a greenhouse structure. Usually gas fired unit heaters are used to augment these systems. Again, it is vital to have an engineered design to ensure proper performance of a bench top system. Back to Top What is a hot water (hydronic) unit heater? Hydronic unit heaters are enclosures equipped with a finned-tube heat exchanger and a fan. They utilize hot water from a hot water source like a boiler and extract heat from the hot water by moving air from the fan over the heat exchanger. Hydronic unit heaters are often used as a way to supplement another hydronic heating system, like a heated slab floor system or bench top heating system. They are quick and very responsive to control inputs. Back to Top What type of boiler should I purchase? They all rely on the availability of hot water and typically the hot water comes from a boiler system. Boilers come in many shapes and sizes. They also come in many styles and construction methods and materials. Because the boiler is where the action of converting your fuel into heat energy takes place, it's important that you consider purchasing the most efficient boiler for your particular needs. Back to Top What are the most common boiler designs available for greenhouse heating? The cast iron sectional boiler is the oldest design and is still quite popular. It is manufactured by casting "sections" of iron The steel water tube boiler design circulates water through steel tubes. The flames and products of combustion pass over these tubes, transferring heating energy and then exit through the vent stack. The copper water tube boilers are similar to the steel fire tube design except that they use copper instead of fire tubes. Copper has a higher capacity for transferring energy and can withstand quick temperature changes that might adversely affect cast iron or steel boilers. Back to Top How does infrared radiant heating work? Any object that is warmer than absolute 0�, radiates energy. Approximately 50% of the sun's energy is infrared radiation or energy in the "far-end" spectrum. This spectrum of energy is not visible so it does not interfere with photosynthesis or photo-period sensitive plant material. Infrared energy travels at the speed of light, reaching the 93 million mile distance from sun to Earth in about 8 1/3 minutes. This energy is then absorbed by the Earth and objects on the Earth, and then converted to heat. That's why it is warmer close to the ground than it is at 35,000 feet in the air, even though that is closer to the sun. Back to Top When should I use a small electrical resistance system? Because electricity is typically substantially more expensive to heat with than other energy sources, these types of systems are not common in commercial environments. In most locations in the United States, electricity costs 3-6 times what natural gas costs per BTU delivered. For small applications of bench top heating, there are several choices of electrical resistance heating systems. These systems are typically installed for "spot heat", usually in spaces of under one hundred square feet. Back to Top Should I install more than one heating system? Many growers are installing multiple heating systems in an attempt to "get the best of all worlds". For example, on temperate nights, they can rely on a bench top system only, and on the cold nights unit heaters are utilized to carry the worst case load and melt snow. Others are installing Infrared systems in conjunction with bench top or floor heating systems. Back to Top So, which heating type is best for me? Every type of heating equipment has its advantages and disadvantages. Depending on the type of production you are planning, you'll need to choose the style of system that integrates best with your production scheme. For example, growers that install mobile tray systems for benching cannot install a bench top heating system because the bench tops need to be free to move around. There are almost endless variations and combinations that can be utilized to create the best environment for your particular production. It's simply a matter of determining your needs and researching the best options with expert industry professionals to develop the best strategy for you. Back to Top How do I find out more about heating? Contact the NGMA for your free copy of the GREENHOUSE HEATING EFFICIENCY DESIGN CONSIDERATIONS. Back to Top What is ventilation? Back to Top What is a ventilation rate? The ventilation rate refers to the amount of ventilation per unit area. It is measured as cubic feet of air-per-minute per square foot of greenhouse floor area (CFM per square foot) because the heat load derives from solar radiation and is directly proportional to floor area. Back to Top What is the difference between natural and mechanical ventilation? Back to Top What does cooling refer to? Cooling consists of reducing the air temperature by the evaporation of water into the air-stream. The system that does this and moves the cooled air through the greenhouse and exhausts the warmed air is the cooling system. Back to Top What is circulation? Back to Top Why is circulation important to my plants? Continuous circulation produces a gentle air movement which maintains a better leaf surface microclimate and prevents pockets of disease-producing high humidity. Back to Top Why is ventilation important? Ventilation allows for the better control of temperature, allowing an increase in light intensity, important to good plant growth because solar heat can be more effectively removed. Back to Top Why should I use exhaust fans? Exhaust fans are used to provide sufficient airflow through the greenhouse to remove solar heat as fast as it enters. Because the air is warmed gradually as it passes through the house, absorbing heat, the flow rate should be sufficient both to hold the temperature rise to a minimum and be economically practical. Back to Top How do I choose a system? Back to Top How do I get the best results from my system? For optimum performance, it is necessary to properly size and arrange air inlet openings to produce a uniformly distributed, non-turbulent airflow pattern in the growing area to avoid the mixing of the lower air with the hot air in the upper section of the greenhouse. A definite airflow pattern in a given direction requires an air inlet opening continuous for the entire side or end of the greenhouse. The inlet opening should introduce the air in a horizontal direction at crop level, should not be deflected up or down and should have a low velocity to minimize turbulence and mixing. Back to Top I have a hobby house greenhouse do I need ventilation and cooling system? 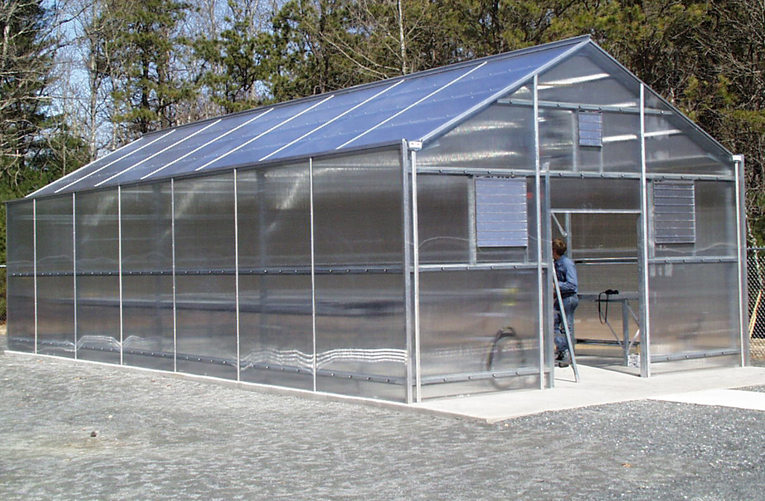 Most small or hobby house greenhouses are generally affected in the same manner and subjected to the same conditions of cooling and ventilating that apply to commercial greenhouses. Therefore, the principals and design recommendation listed for commercial greenhouses are normally used. For very small greenhouses, however, package evaporative coolers provide simpler installation and more convenient operation. Back to Top Do I need to change my system in the summer? During the summer, mechanical ventilation alone will usually not maintain the desired greenhouse temperature because the outdoor air is too warm. A means for cooling the incoming air should be provided. Back to Top What happens to the cooled air as it moves through the house? Back to Top Is elevation a factor in creating ventilation and cooling systems? The air's capacity to remove heat depends on its weight, not its volume. Because air is less dense at higher altitudes, the elevation of the greenhouse must be considered in design calculations. At higher elevations a greater volume of air is needed to provide the equivalent weight of air required at elevations that have been established as normal. Back to Top How many fans are needed and what do I need to know before having them installed? The size of fans selected determines the number of fans required. 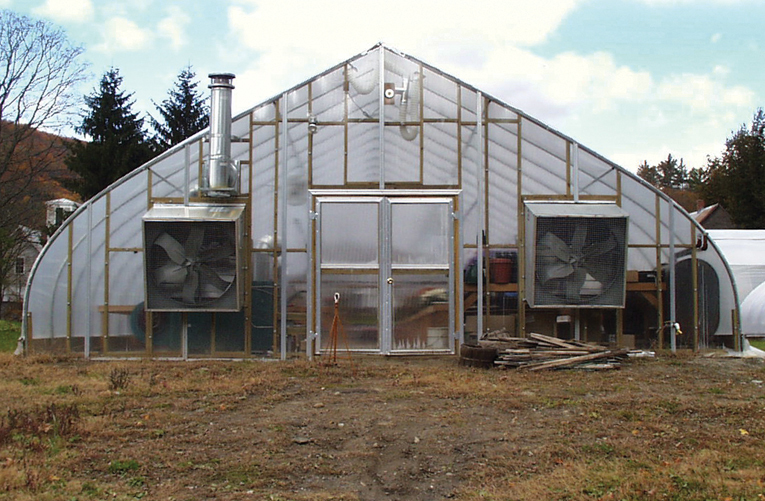 Adequate fans should be used to provide a spacing of not more than 25 feet along the exhaust side of the greenhouse. When possible the fans should be located on the downwind side of the greenhouse. When three or fewer fans are used in a given installation, one of them should be a two-speed fan to provide for more flexibility of ventilation. Fans should be guarded properly to prevent workers or animals from coming in contact with any moving parts. For most reliable fan performance, only use fans that have been tested and rated by the Air Movement and Control Association (AMCA) standard test code and which bear the AMCA Certified Rating Seal should be used. Back to Top Where should the cooling pad be placed? Back to Top What if the pad is located outside the air inlet opening? If the pad is located outside the air inlet opening, it should be continuous, have no large obstructions and should be centered in elevation on the center of the pad so that the airflow is horizontal as it leaves the opening. When the height of the pad exceeds that of the air inlet opening, the pad will extend above and/or below the opening. When this occurs, the pad should be set back from the wall or sash at a distance of at least half the amount of the extension to provide ample room for air to pass uniformly through the entire pad. When possible the pads should be located on the prevailing wind side of the greenhouse. When the greenhouse is sheltered from prevailing winds by another building or greenhouse located within 25 feet, the location of the pads in relation to prevailing winds is not significant. Back to Top How and why should I use Baffles? The cooling air passing through the house will tend to diverge at about a 7-degree-angle or one foot in every eight. Vertical baffles usually are installed particularly with the house, to reduce mixing and keep cool air down at plant level. The baffles should be transparent, spaced approximately 30 feet and held in a fixed vertical plane, and their lower edges should be well above plant level. In greenhouses containing raised benches, a substantial volume of air may travel under the benches to the fan without removing much heat. A baffle covering two-thirds of the distance from the bench to the ground will force most of the cooling air to crop level for more effective plant cooling. Back to Top How do I maintain my water system? All elements of the water system should be kept well covered, to protect it from insects and wind-born dirt, which will ultimately cause clogging. The water returned to the sump should be screened. The ends of the water distribution pipes should be provided with removable caps or valves to allow easy flushing out for cleaning. Because water is used up in the evaporative cooling process, a supply of makeup water is needed. An automatic float valve should be used for this purpose and also to maintain a proper water level in the sump. Back to Top Are winter and summer ventilation systems the same? Back to Top Do I need to ventilate differently in the winter? Mechanical ventilation essentially provides the same benefits regardless of the season, but winter calls for different airflow principals. In the winter, outdoor air is too cold to introduce directly on the plants. The goal of winter ventilation is to introduce the cold air in a turbulent manner. This causes the cold air to mix with the warmer air in the greenhouse, without producing cold drafts at plant level. This mixing is the result of using small high-velocity jets. In a greenhouse it is desirable to have many small, well-distributed openings rather than one large one for winter ventilation. It is important that all areas of the greenhouse are at the same temperature. To achieve this, the ventilating system must distribute the air uniformly throughout the house and maintain positive air movement and continuous circulation. Back to Top Can I use gravity to circulate the air in my greenhouse? Back to Top What do I use thermostats for in my greenhouse? Back to Top What do I use a Humidistat for? Back to Top How can I find out more about ventilation? More detailed information is available by looking to the NGMA website. You can download the ventilation guidelines or contact the NGMA for a copy of its greenhouse standards notebook which is $25 (includes shipping within the United States). Back to Top How does electricity work? Electricity moves through wires, pushed along by a force called potential. Electric potential is measured in units of volts. The voltage forcing electricity through the power wiring comes from a utility company's generating plant. Large wires are needed to carry large currents. Electricity faces resistance to its flow through a wire, and in fact, resistance is the electrical term for the force that works against the free-flow of electricity. Resistance is measured in units called ohms. Electricity, voltage and current all work together to form power, which is measured by Watts. Back to Top What is voltage drop? In a greenhouse, equipment can easily be hundreds of feet from the circuit breaker panel that feeds it power. Wires have resistance and resistance works against voltage. This effect is called voltage drop and relates directly to the efficiency of the equipment we connect with electrical wiring. Voltage drop also has another effect: the voltage doesn't just disappear, it gets converted into heat that is wasted, even though you pay for it on your utility bill. Back to Top How do I eliminate voltage drop? While there's no way to completely eliminate voltage drops and other inefficiencies, you can minimize them by working with a design engineer who is familiar with greenhouses. A design engineer will work with you to provide an electrical system that meets your requirements for safety, efficiency, adequacy, convenience, and spare capacity. You'll need to coordinate both the design and installation phases of your electrical system with your local electric utility. As only they can tell you if they can provide the type of system you require, with the capacity you need. Back to Top What are the most important things to consider when creating an electrical greenhouse system? Demand that all work be done in accordance with the National Electric Code and local codes. List all equipment requiring electricity. Have a design engineer prepare a load schedule, main service and branch layout, power diagrams, wiring layout, and control diagrams. Back to Top What is a load schedule? This is an inventory of all the electrical equipment in your project. The total electrical demand of this equipment determines the size of electrical service you'll require. Back to Top What is the main service and branch panel board layout? This shows the location and size of your service entrance components and any additional circuit breaker panels you will need. The service entrance is where the wires from the electric utility enter your property and include a large switch or circuit breaker that can disconnect your entire premises from the electrical grid. Back to Top What are one-line power diagrams? These diagrams show how your equipment will be assigned to individual circuit breakers and breaker panels. These plans show the number and the sizes of the wires that will carry power to your equipment. Back to Top What is a conduit and wiring layout? This diagram shows where conduits will be routed, the sizes of the conduits, and the number and sizes of the wires that will be run in conduit. Back to Top What are control diagrams and schematics? These plans show the interface between control devices and the equipment they control. Back to Top Where should I locate my main service? The location of your main service entrance must be coordinated with your electric utility. A central location minimizes wire lengths and reduces both the costs of voltage drop and of wire itself. A centrally located main service is your most efficient and economical alternative. Back to Top What type of power system should I get? One-phase systems are commonly used in houses and small businesses. Three phase systems are used in schools, medium to large businesses, and industrial plants. Though three phase power is not available everywhere there are technical advantages that should be considered. Do not be afraid to go for high voltage. The higher voltages offered mean; the voltage drops are less significant. Because power is the product of volts and amps, a higher voltage means we can deliver the same total power while using fewer amps. The practical benefit of reduced amperage is reduced wire size. Back to Top What are the advantages to three-phase power? Three-phase motors are less expensive than single-phase motors for motors of one horsepower or larger. Also, they are mechanically and electrically simpler than single-phase motors. This means they are more reliable. A three-phase system can use smaller wires and conduits than a single-phase system. Back to Top Do I need a standby generator? Because a greenhouse can lose and gain heat so rapidly, it is critically dependent on a constant supply of power for its heating and cooling systems. Because a power outage of more than a few minutes can mean the loss of your livelihood, you must consider a standby generator when you plan your electrical system. Back to Top How do voltage drops effect crop lighting? Voltage drops have a disproportionate effect on the light output of incandescent lamps. If the electrical system delivers a voltage below the rated operating voltage of the lamps, they cannot deliver the intended amount of light. Though the light loss can be significant and is often undetectable to the human eye. Back to Top What are the benefits of high-efficiency motors? Though high-efficiency motors cost more than standard motors, the energy savings they offer easily outweigh the cost difference. A one-horse power high efficiency motor can pay for the cost difference in only four months of typical greenhouse use. A high-efficiency motor is built using more copper wire and iron than a standard motor. It runs cooler than a standard motor. Back to Top What is a ground-fault circuit interrupter? A ground-fault circuit interrupter, or GFCI, is a safety device that protects people from possible electric shock hazards. A typical GFCI is built into an electrical outlet to kill the power once an electrical fault is detected. The National Electrical Code (NEC), which regulates electrical wiring, has begun to require ground-fault circuit interrupters in more and more locations; particularly in damp locations in contact with the earth or concrete. Back to Top Where can I attain more information regarding electrical standards? The NGMA has published an electrical guideline which you can receive for free by contacting the office or downloading off the NGMA website. Back to Top How are environmental control computers important in raising a crop? In addition to controlling humidity and temperature, they can manage shade systems and supplemental lighting, control CO2 concentration, schedule and sequence irrigation valves, and control the pH, EC and temperature of the irrigation water. Because they integrate these functions into a single controller, environmental computers can manage the interactions between these elements, giving the grower a tool to optimize production. Back to Top Do they respond to both the greenhouse and outdoor environments? Yes, they monitor wind speed and direction to protect vents from damage. Many can use wind speed, outdoor temperature, and light level to anticipate heating and cooling demand, and to control the firing of boilers. By measuring outdoor humidity, they can compute whether dehumidification of the greenhouse is possible. Back to Top How can they minimize energy costs? Computerized environmental controls help minimize energy costs by closely controlling the environment, and by integrating and coordinating the use of all the climate control equipment in the greenhouse. Back to Top Is there a way to reduce the amount of chemicals used on crops? Yes, by using an environmental control computer humidity can be controlled, reducing mildew and cutting down on the amount of fungicides needed. Some systems offer pesticide programs that guarantee the environment will be closed for the necessary dwell time, then ventilate for safe reentry of personnel. "DIF" programs can reduce or eliminate the need for growth regulators. 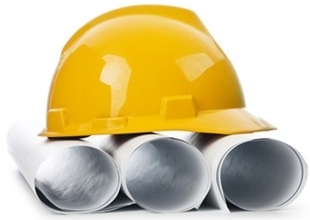 Back to Top Can labor be reduced through an environmental control system? Yes, in many ways. Environmental control computers can create a model of how the environment should be controlled, dramatically reducing the manual intervention needed from the grower and staff to maintain desired conditions. Back to Top Can an environmental control computer change crop quality? Because they monitor and control temperature, humidity, and light intensity constantly, environmental control computers create the most uniform conditions possible. This leads to increased uniformity in the crop. "DIF" programs are easy to implement with computers, and have been proven to be effective in producing compact, well-branched plants that sell more readily or for higher prices. Back to Top Does the computer keep records and how can they be used? Environmental control computers keep records of their sensor readings and equipment usage. This allows the grower to monitor past conditions, and events on nights and weekends. This data can be carried over from crop to crop and used as a tool in crop timing and quality control. Equipment usage records can also help in planing maintenance schedules. Back to Top Can the computer help in plant modeling? The data from most environmental control computers can be fed directly into manual or computerized graphical tracking programs. In many cases the data can be passed automatically to computerized tracking systems, without the need for re-keying. Back to Top How does the computer acquire data from the greenhouse? Sensors in the greenhouse send an electrical signal (either voltage or current) that varies as the quality measured varies. To use this data, the computer converts it to a number that its program can process. An environmental control computer uses a device called an analog-to-digital converter for this purpose. Back to Top How does the computer control the equipment? An environmental control computer must be able to operate the equipment that heats, cools, or otherwise alters the greenhouse environment. It usually does this by turning relays on and off, or by sending voltage or current signals to the equipment. Back to Top Does the computer generate alarms? An environmental control computer will generate alarms when it detects conditions that threaten the crop. Examples of alarm conditions include high and low temperatures, power failure, and any failure of the computer to operate properly. If you have equipment that operates on three-phase power, consider a computer that can detect phase failures, and generate an alarm to protect your equipment. Back to Top How will the computer respond during a power failure? Environmental control computers retain all your settings during power failures that last several hours. It is not essential that the computer itself continues to operate through an outage, since the equipment it controls cannot respond. If your stand-by generator doesn't have enough capacity to operate all the equipment, consider a computer that can selectively shed load while on standby. When power returns, be sure your computer will gradually turn on the equipment that's needed: turning everything on at once can stall a generator, or trip the overload protection on your electrical service. Back to Top What are the advantages of a centralized single system? A single central computer consolidates all control and supervisory functions at one location. Information and control functions that are common to all zones in a greenhouse range, like weather data or boiler control, need not be communicated between multiple computers. Because only one computer is needed, a single central unit can be the most economical choice. Back to Top What are the disadvantages of a centralized single system? In a single computer system, if there is a problem with the computer, it affects the whole greenhouse range. Also, wiring of sensors can become complex. Either all the wiring must be brought to the central computer, or brought to concentrators that send and receive signals from the central control. A single central location can be distant from some zones, and therefore less convenient. Furthermore, for a large range, a powerful enough computer may actually be more expensive than multiple smaller computers. Back to Top What are the advantages of a multiple computer system? In case of a problem with one computer, other computers in the greenhouse range are unaffected. Multiple computers can be located near the areas that they control. This can reduce cost and complexity of wiring and improve convenience of use. Back to Top What are the disadvantages of a multiple computer system? Multiple computers require a communication link in order to share information about weather or equipment common to zones controlled by more than one computer. Because you are buying more than one computer, it may be more expensive than a single, centralized unit. In practice, many greenhouses need only one unit of a multiple computer type system and they do not gain the benefit of the multiple system. Back to Top What types of temperature sensors are there? Common temperature sensors include thermistors, thermocouples, and integrated circuit types. Thermistors are devices that restrict the flow of electricity in a way that varies with temperature. Thermocouples use two dissimilar metals welded together that generate a small voltage that depends on temperature. Integrated circuits vary a voltage or current that is supplied to them in a way that varies with temperature. Typically, thermistors and IC's are the preferred types, since they give accurate results with less expense than thermocouples. Back to Top What kinds of humidity sensors are available? Typical humidity sensors are capacitate, resistive, or wet bulb/ dry bulb types. Capacitate sensors absorb and give up moisture form the air as humidity changes, and vary their electrical characteristics in a measurable way. Resistive sensors also absorb and give up moisture as humidity changes, and restrict the flow of electricity in a varying way similar to thermistors. Wet bulb/ dry bulb sensors measure the temperature of a dry sensor and by a wet wick in an in a water reservoir. In dry conditions, the wet wick cools it sensor more than in humid conditions. The difference in temperature from the dry sensor can be translated to a humidity reading. Wet/ dry types are the "gold standard" of humidity sensors, offering the most reliable readings. However, they require routine maintenance of wicks and water reservoirs, and they don't work outdoors in freezing weather. Capacitate and resistive humidity sensors require no maintenance, but can readily be contaminated by chemicals in the greenhouse environment, requiring recalibratation or replacement. Resistive types appear to withstand the environment better than capacitate types. Back to Top What are the common types of light sensors used with the computers? Common light sensors include photodiodes and photoresistors. A photodiode is a device that generates electricity when exposed to light. A photoresistor changes the amount it restricts the flow of electricity according to how much light falls on it. Both photodiodes and photoresistors "see" wavelengths of light outside of photosynthetically active radiation (PAR), but can be filtered to limit the angle at which light strikes them, and it may be desirable to choose a type with a diffuser ("cosine corrector") for best accuracy early and late in the day. Back to Top How can I measure wind speed? Most wind speed sensors, or anemometers, are either generators or tachometers. Generators generate electricity when the wind turns their cups or propellers. Tachometers use a striped or slotted disk attached to a shaft that the wind turns. The disk interrupts a beam of light on a light sensor sending an electric pulse to the computer. The computer measures how quickly the pulses come in and translates the rate to the speed. Tachometers are potentially more sensitive than generators, but there is no practical difference in their suitability for use with environmental control computers. Back to Top Are there different wind direction sensors? Wind direction sensors include resistive types, and digital resolvers. As the wind vane turns on a resistive sensor, it moves a wiper on a circular resistor, analogous to the volume control on a radio. A digital resolver uses three of more light sensors to read a pattern of stripe printed on a disk attached to the wind vane. These patterns translate to wind directions. Resistive types offer higher resolution than resolvers do. In practice, available control systems report only the points of a traditional compass N, NNE, NE, ENE, etc. Back to Top Are there different types of precipitation sensors? Precipitation sensors may offer detection only, or they may measure the amount of precipitation. Detectors trigger when rain or snow closes an electrical circuit between two interleaved electrodes. Units that measure precipitation typically use a funnel to feed rainwater to a small cup balanced on a hinge. When the cup fills, it tips and empties itself, and momentarily closes a switch that sends an electrical pulse to the computer. Since the volume of the cup is known, the computer can measure rainfall by counting pulses. In greenhouse applications, it's enough to detect rain, since the amount will not affect indoor irrigation. Look for a detector with a heated grid to detect snow and drive off dew. Detectors should drive their electrodes with alternating current rather than direct current, which causes the electrodes to fail prematurely. Back to Top Are there sensors that test pH? Yes, there are sensors to test pH. These sensors work on a principle analogous to that of a car battery. They generate a voltage proportional to how acidic or basic the solution they are immersed in is. They also respond to the temperature of the solution, so the readings must be corrected for variations either by the computer or electronically. These sensors must either use special cables, or be amplified near where they are used to deliver a clean signal to the computer. Back to Top Can the sensors test the EC? EC sensors measure the flow of electricity between two metal probes. The more fertilizer present in the water they are immersed in, the more electricity flow. Like pH sensors, EC sensors also respond to temperature and must be corrected either electronically, or by the computer. Typical applications use redundant sensors, and compare the readings to check for sensor fouling or sensor failure. Back to Top How can I learn to use my environmental control computer? Computer environmental controls now include so many features and options that most users need some help in learning to use them. You can learn more about environmental controls by contacting your NGMA greenhouse or environmental control manufacturers. Back to Top Where can I get more information about environmental controls? Contact the NGMA office for a free copy of the Environmental Control Guidelines or download it off of the NGMA website. Back to Top What are greenhouse curtains? Greenhouse curtain systems are called shades, screens, and even blankets. No matter what they are called, they consist of moveable panels of fabric or plastic film used to cover and uncover the space enclosed in a greenhouse. Curtains may cover an area as small as a single bench, or more than an acre. Small systems are often moved by hand and large systems commonly by motor drive. Internal shade systems mount to the greenhouse structure below the rigid or film covering of the house. They are used for heat retention, shade (and the cooling effect of shade), and day length control or blackouts when the covering transmits lower than 1% of the incident light. Back to Top How do the curtains provide heat retention? Any interior curtain system can be used for heat retention at night when heating demand is greatest. Blackout systems can serve this purpose, even when day length control is not a consideration. The amount of heat retained and fuel saved varies according to the type of material in the curtain. Curtain systems can save energy in three ways; they trap an insulating layer of air, reduce the volume that must be heated, and when they contain aluminum strips reflect heat back into the house. A curtain system used for heat retention traps, cold air between the fabric and the roof. This cold air falls into the space below when the curtain reopens in the morning. To avoid stressing the crop, it is important to uncover the curtain gradually to allow this cold air to mix with the warm air below. Alternatively, if the crop can tolerate the shade, the curtain can be left uncovered until sunlight warms the air above the system. Back to Top How do the curtains provide shade and cooling? Interior curtain systems are widely used to reduce indoor light intensity and help control temperature during the day. Curtain systems also eliminate the recurring cost of materials and labor to apply shading paint. Most curtain systems now use fabric made of alternating strips of clear and aluminized polyester. The aluminized strips reflect light back out through the roof of the greenhouse. This reduces the cooling load under the shade significantly. Back to Top How can I attach the curtains to my greenhouse? 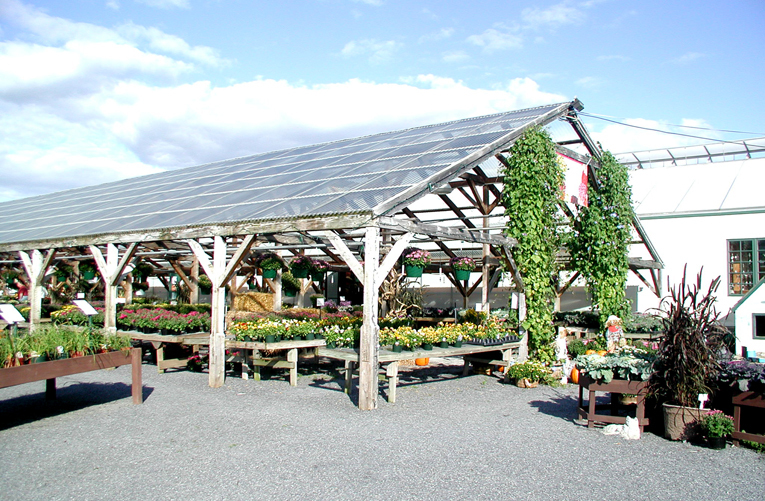 The fabric panels in a curtain system can be driven gutter-to-gutter across the width of the greenhouse, or from truss-to-truss down its length. In a gutter-to-gutter system each panel of curtain material is essentially the size of the floor of one gutter-connected house. In a truss-to-truss system the panels are wide enough to span the distance between one truss and the next. In either configuration, each panel of curtain material has a stationary edge, and a moving edge. The drive system moves the lead edge back and forth to uncover and cover the curtain, while the stationary edge holds each panel in place. Back to Top How does the gutter-to-gutter system work? The curtain panels are pulled flat across the width of the greenhouse at gutter height. This configuration minimizes the volume of greenhouse air below the curtain that must be heated. These systems require less installation labor than a typical truss-to-truss system. However, gutter systems are not ideal for every greenhouse. If unit heaters or circulation fans are mounted above gutter level, the curtain will block them from heating or circulating the air under the system, where the crop is. 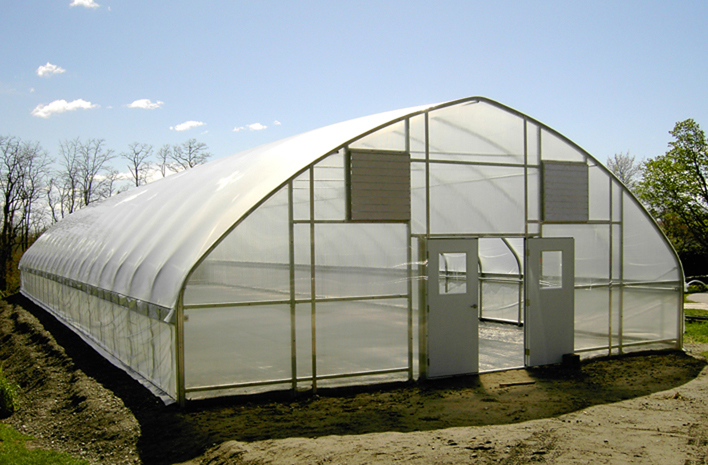 Though the volume of greenhouse space that is heated is reduced, the amount of cold air is maximized. This makes it harder to mix and reheat the air above the system when it uncovers in the morning. Retrofitting can also be a problem if the gas lines, electrical conduits, and heating pipes are mounted at gutter level. Because the curtain panels are a wide as the greenhouse when the curtain is uncovered, the curtain material forms a large bundle under each gutter. This bundle can be a source of unwanted shade. Back to Top How does the truss-to-truss system work? With a truss-to-truss system, the panels of curtain material move across the distance between one truss and the next. This distance leads to more compact bundles of fabric when the system is uncovered than are possible with gutter-to-gutter. There are three ways to configure the truss-to- truss system. First it can be flat at gutter height, minimizing heated area and making installation easy. Second it can be slope-flat-slope, where the profile of the curtain follows each slope of the roof part way up the truss, with a flat section joining the two sloped segments. The benefit of the Slope-flat-slope curtain system is that it can be installed over equipment, and mounted above the gutter. The third type is slope-slope, where the profile of the system parallels a line drawn from the gutter to the peak of the truss. This configuration minimizes the amount of cold air trapped above the curtain and maximizes clearance from equipment mounted above gutter height. Back to Top How does the drive mechanism work and are there different methods? Drive mechanisms use an electric motor and gearbox to extend and retract the panels of curtain material in a system. They solve the problem of translating the rotary motion of the motor and gearbox into the linear motion needed to move the curtain panels. There are three basic methods. The push-pull drive can be used to move truss-to-truss systems only. Both the cable/drum, and the chain and cable drives can be used for both gutter-to-gutter and truss-to-truss. Back to Top What is a support system? Curtain systems support the panels of curtain material on wires or nylon monofilament lines parallel to the direction of the movement of the curtain. These lines are uniformly spaced across the greenhouse at distances of eighteen inches to four feet on center, depending on the design of the system. Two support systems are commonly used. In a lay flat system, the curtain panels lie on top of the support lines. In a suspended system, the panels hang from the support lines on plastic hooks. Curtain panels can lie on top of the support lines if monofilament or smooth stainless steel wires are used. This approach reduces installation labor, as the curtain panels need only be draped over the wires. The friction of the panels against the smooth wires does not appear to cause premature wear on the panels. In houses with roof vents, lay-flat panels should be trapped from above by additional stainless steel or monofilament lines. These lines prevent the curtain panels from billowing up as air circulates in the house. Curtain panels can also be suspended from the support lines with plastic hooks. However, the plastic hooks must be installed in the curtain panels before they are attached to the lines. Typically, reinforcing strips are sewn into the curtain panels where the hooks attach so that the hooks do not tear through the curtain material in use. Back to Top What type of material are the shade and retention curtains made of? Covering materials for shade and heat retention include knitted white polyester, non-woven bonded white polyester fiber, and composite fabrics manufactured specifically for use in greenhouse curtain systems. The white polyester fabrics offer excellent durability. White polyester has largely been superceded by composite fabrics made of alternation strips of clear and aluminized polyester or acrylic held together with a finely woven mesh of threads. These panels outperform white polyester because their aluminized strips reflect infrared light out of the greenhouse during the day, and back into it at night. The composite fabrics include; chemical stabilization against breakdown by UV light, flame resistant fabrics to meet building code requirements, and fabrics where the clear strips are omitted, leaving gaps for air circulation. Back to Top What type of material are blackout curtains made of? Blackout curtains include polyethylene film, knitted polyester, and composite fabrics where all the strips are either aluminized or opaque. Most blackout materials attempt to reduce heat buildup when the curtain system is covered for day-length control in summer. Knitted polyester is available with a powered aluminum reflective coating bonded to one surface. Polyethylene film is by far the least expensive blackout material, but it is impermeable to water and water vapor. If the greenhouse leaks when it rains, water can build up in pockets the film, and weight can damage the support system the support system of the curtain. Polyester knits and composite fabrics are porous and allow water and water vapor to pass through. This reduces the chance of water-weight related damage to the system knit and also offers a longer service life than does film. Back to Top What are sidewall curtain systems? Sidewall curtain systems are used to form interior partitions, to cover walls in blackout systems, to shade south facing walls and to cover and uncover sidewall vent openings in place of glazed vent or louvers. Back to Top What types of exterior curtain systems are available? There are three types of exterior curtain systems available. A motor and gear driven shade system can be mounted above the greenhouse roof to reduce the amount of heat and light that enters the structure. A dark colored or aluminized mesh can be stretched over the greenhouse roof and left in place for the duration of the high-light season. The curtain system can serve as the greenhouse roof, uncovering for maximum light and ventilation, and covering for weather protection. Back to Top How can I find out more about curtain systems? The NGMA has published an External and Internal Greenhouse Curtains Considerations document that is free. Contact the NGMA office for a copy or download it off of the NGMA website.